Everyone loves the look of a classic Porsche in top condition and the Revolution Porsche team can help you to achieve it whatever the vintage of your car, with our Porsche Restoration and Backdating services. We have plenty of experience of full restorations of Porsches, undertaking every element of transforming older models suffering from age-related wear and tear, accident-damaged cars and vehicles poorly maintained by previous owners back to their full showroom glory. Our team now also offer a Porsche backdating service for owners who are happy with the performance of their car, but want it to look like their favourite classic or a head-turning rare model. 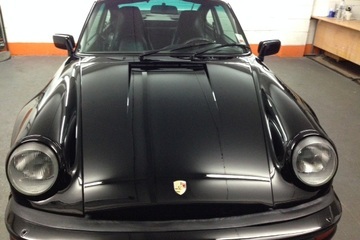 Why choose Revolution Porsche to restore your car? Our technicians are all Porsche fanatics and have in-depth knowledge of cars across the full model range, including air-cooled 911s, limited editions and front-engined 1980s models. That has helped them to successfully complete a number of authentic restoration projects, ranging from accident damage repairs to full vehicle rebuilds from a bare shell, all to a superb standard. Our technical expertise is backed by an in-house parts sourcing operation, which can usually track down hard to find components. Where the right parts are no longer available, our technicians are often able to fabricate them. We know that if you are going to the trouble of organising a full restoration of an older Porsche model, authenticity will be important to you. Using official Porsche data sheets and colour charts, we will do everything possible to make your restored car as close as possible to its showroom condition. To arrange a discussion about restoring your Porsche or a car you are thinking of buying, complete the Request An Estimate form and we’ll give you a call. Revolution Porsche now offer a full backdating service to give your car the look of your favourite classic Porsche. Many of the most desirable Porsches are difficult to find and when they do become available, the six-figure auction reserves are beyond the budget of most enthusiasts - but a backdating project could allow you to own your dream drive. Backdating is the process of taking a newer car (or often, a cheaper used Porsche) and putting it through a retro restoration to give it the styling of an older or limited edition model. It’s amazing what can be achieved and, when the work is completed to a high standard, even Porsche fanatics would struggle to tell that the ‘RSR’ you are driving began life as a base-level 911. The Revolution Porsche team can undertake every element of your backdating project, from initial advice about what is possible for your car through to completing the work. Our team of expert technicians and body shop specialists have an in-depth knowledge of the Porsche model range from the 911 Classic up to the latest cars, and have the skills needed to complete any required engine or bodywork upgrades. This technical expertise is backed by an in-house parts sourcing operation, which can find the right body kits, exhaust systems, wheels etc needed to transform the look of your car. If you are interested in backdating your Porsche and want to discuss what is involved, complete the Request An Estimate form and we’ll give you a call. Send us some photos of the Porsche you want us to work on.